Blockchain technology is changing the way art is distributed and collected. Digital art is now being made rare and verified as limited edition collectible items, by running on top of cryptocurrency networks like Bitcoin, Ethereum, and EOS. Because of the fast pace of development in this space, the crypto art experience, as an artist and a collector, has been time consuming to learn. Yet it entirely worth the somewhat steep learning curve, due to the increased level of opportunity in the industry. Rarely is this field streamlined or uniform in process across the various rare digital art marketplaces. For newcomers, both collectors and artists, navigating these new frontiers is somewhat like stepping into a new universe. Therefore, what's needed in the crypto art space is more hands-on reporting and analysis on what is working now, as well as professional insights from active participants on where the crypto art movement needs to go. To meet the needs of the budding crypto art industry, pixEOS is honored to host a series of ongoing business-friendly articles from crypto artists. These are in-depth reports from pixEOS Featured Artists who are active in the crypto art market. Each article covers their professional experiences in the rare digital art space, regardless of blockchain affiliation. It is intended for this behind-the-scenes series to equip readers with real-world crypto art business analysis. Join us as we unify, educate, and inspire collectors, artists, and entrepreneurs alike about the fascinating world of crypto artist experiences. For the sake of clarity, the terms "rare digital art," "non-fungible tokens (NFTs)," "crypto collectibles," "blockchain cards," and "crypto art" will be used interchangeably in this series. For the purposes of these reports, the terms all basically refer to the same thing: digital art that is issued in limited editions through a cryptocurrency network and programmed to be verifiably rare using blockchain technology. This report will outline a few of the crypto art markets in which I have been active on. It comes from my perspective as a seasoned artist/publisher/collector in the blockchain space with over 3 decades in the cartooning field, mostly on Silly Daddy Comics. It is intended that crypto art and gaming projects as well as professionals--regardless of their particular affinity to a certain blockchain--will be able to learn from these observations and steer their crypto art business towards an even brighter future. There are so many innovative NFT markets worthy of further attention. For example, I must briefly mention the incredible innovation behind CryptoSketches as well as Cryptographics. Both of these sites have to be experienced to be believed. CryptoSketches is an NFT market that stores an artist's vector drawings made in its app on the Ethereum blockchain. Cryptographics is an NFT market where an artist can mix and remix elements of one artist with elements of another artist to issue new hybrid NFTs, also on Ethereum. Time will not permit me to cover them here in greater detail, but do check them out for yourself. I will mainly focus on the 3 NFT markets in which I have had the highest volume of NFT sales. In no way am I saying that these 3 are superior to other NFT markets. Yet these 3 are where I have had the most action: namely on Book of Orbs, SuperRare, and MakersPlace. Book of Orbs marketplace runs on Bitcoin, with Counterparty on top. This ecosystem is the birthplace of NFTs. Indeed, the first rare digital art was issued on this marketplace by EverdreamSoft (EDS) for their Spells of Genesis game. Spells of Genesis is a very fun blockchain based game, where NFTs that EDS issues can be used in the game or traded on the market. I still play the game today and also have my eye out to collect more of their NFTs. 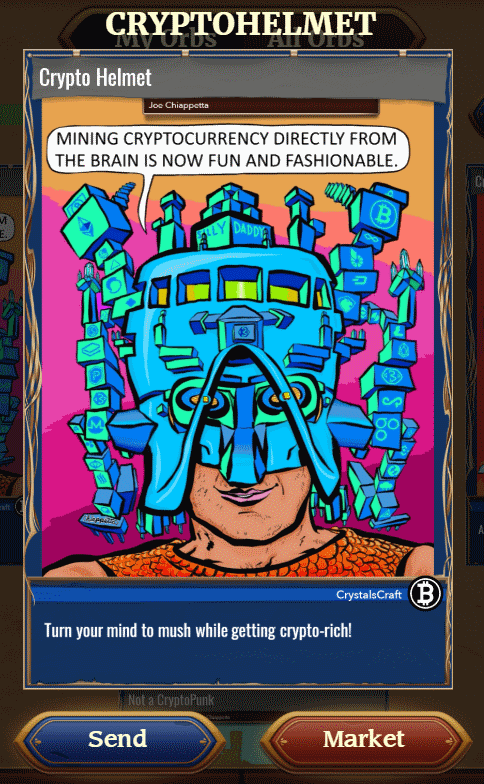 EDS created a Counterparty token called BitCrystals in 2015 which is what collectors can buy blockchain cards (aka NFTs) with in the game. BitCrystals were also used as their fundraising mechanism, now known as an initial coin offering (ICO). This was before Ethereum launched ERC 20 tokens and before there even was a term "ICO." EDS also started another NFT collection in Book of Orbs called CrystalsCraft, also purchasable using BitCrystals. That's where much of my art is located. It is also where I have experienced the highest volume of sales of my NFTs. When CrystalsCraft collection was announced, I did not know any of the EDS team. But I read their blog and social media regularly, in addition to being a game player and collector of Spells of Genesis NFTs. What I really liked about the CrystalsCraft collection, is that I didn't have to be "in" with anybody to get on their marketplace. Reputation did not matter at all. That had great appeal to me because many of the other NFT markets were the opposite, only launching with a handful of their own small crew of artists. And if an artist couldn't get "in" with the gatekeepers at these other markets, rare digital art sales were not yet open to them. With the CrystalsCraft collection, without knowing anyone, anyone can go to their website, pay a fee to them in BitCrystals, buy some Counterparty token to register the unique token name for the NFT, fill out a form on an EDS site, upload the art, and then wait. In about 2 business day or less, a staff then slaps the art on the CrystalsCraft blockchain card template, assigns the Counterparty token name picked out by the artist, and issues it to the blockchain. 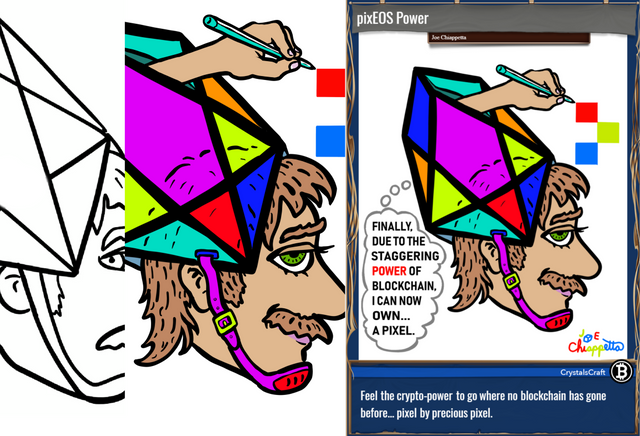 Artwork theme had to have some sort of blockchain allegory to it. The learning curve is high for this process, as were the fees when BitCrystals was at its all time high price of well over $1 per unit. BitCrystal fees where lower the less rare the NFT was. Artists set the rarity levels from as rare as 200 editions to as high as 10,000 I think. I did not have to verify who I was. Nor did I have to submit a portfolio or social media links. I just needed to follow the previously mentioned procedure and I became one of them. I think that is pretty cool. Understand that I remember the old days--before digital--when artists (self included) would have to submit physical slides to galleries by mail, and wait to see if they would reply back. Shortly after issuing art through them I also wrote a very down-to-earth article about rare digital art that they used on their website. It was very well-received, and as a short piece, it succinctly explained the value of crypto-collectibles. I still recommend it to onboard new people into this growing field. Later I wrote a longer article covering 3 aspects of crypto art, also well-received and mentioning Book of Orbs as well. The fact that EDS made a great product inspired me to want to write about them. So in many ways, I on-boarded myself to them, since in these early days of rare digital art, information was thinly scattered all over the place. So to get a clearer picture of a particular project, a person would need to look in numerous and remote places to gage its integrity. In doing this research on EDS, I was won over. EDS runs a Telegram channel called "BitCrystals" (currently with over 500 members). I got to know other artists and EDS staff there over time. It is a generally friendly, community of sporadic engagement, and is a mix of people interested in the game, the price of BitCrystals, and lastly, NFTs. My involvement there led to me being selected with a few other artists to beta test a more direct way to issue NFTs through CrystalsCraft that EDS launched later in 2018 called BitCrystals Asset Creator. 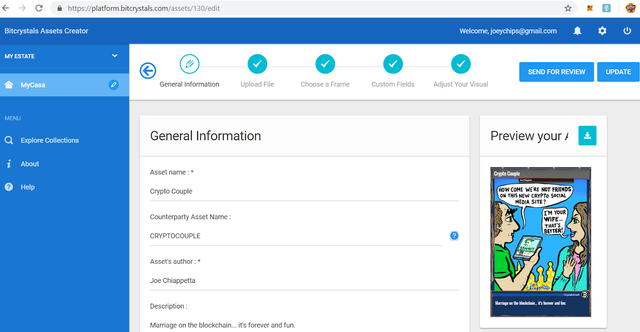 With BitCrystals Asset Creator, artists bypass paying any BitCrystals fee to EDS. All that is needed is to buy 0.5 Counterparty token to register the unique name of the artist's NFT. Use the Asset Creator to fill in the NFT metadata, upload the art, align it to the CrystalsCraft template (like a skin), and submit it. Still, an EDS staff needs to manually approve this, which often happens the same business day. Through CrystalsCraft, currently issuing NFT animated GIFs is not yet available. This is not a Counterparty limitation, but one that EDS has not yet developed for. 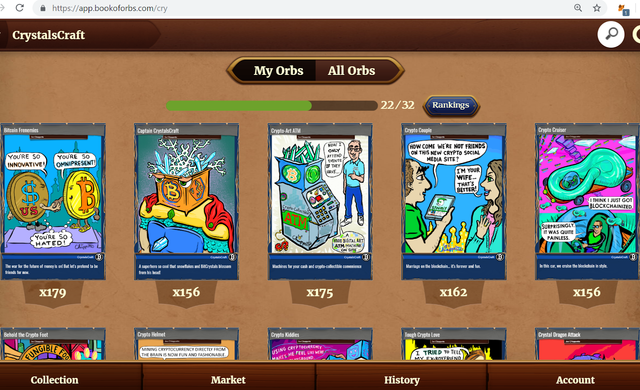 Book of Orbs wallet is available as an app in Google play store as well as a desktop web app. The Google Play app has a very nice collectible feel to it. It is the kind of interface that a collector is excited to open up at parties and networking events and show off. I have issued nearly 20 different NFTs through CrystalsCraft, mostly through their more self-directed BitCrystals Asset Creator, in editions of 200 each. Most of the time, I will sell at least a few cards on the same day that they are released. Some collectors even buy 2 to 5 at a time of the same NFT, and for every design, I have sold at least 20 to 40 editions of each one. A few designs have already sold almost 100 editions. I chose to keep the price of my NFTs there very low, like people are buying a pack of trading cards at the convenience store. The NFTs bought through Book of Orbs in CrystalsCraft, as well as Spells of Genesis game collection, are purchased using BitCrystals. Note that with all Counterparty tokens, the purchaser also needs a little Bitcoin in their wallet to pay the transaction fee. This is usually a few cents. But when Bitcoin has network problems, the fees can get much higher, which is a customer repellant. Book of Orbs wallet has a fantastic "send" feature. Let's say an artist just wants to give a friend an NFT for free. The artist can do that in the wallet at no cost to the friend as long as the artist has the friend's Book of Orbs BTC address. But the sender (in this case the artist) does need to still pay the BTC transaction fee. Another use case for this is giveaway promotional items. I have run contests in the BitCrystals Telegram where the first person to answer a question correctly receives a free NFT from me. It is fantastic for community building and increased engagement. A number of gaming companies, to support the launch of their new products, have also used Book of Orbs to issue free collectible blockchain cards to attendees at various trade shows. Buying CrystalsCraft NFTs had hit a bit of a setback when a US cryptocurrency exchange (Bittrex) delisted BitCrystals in late 2018. Some say the delisting was due to low volume. Others say it was because EDS needs to get a legal opinion about whether or not its pre-ICO tokens would be a concern for the US government's SEC, even though EDS is a Swiss company. EDS resolved the issue somewhat; now there is a site where collectors can buy BitCrystals very easily. Note also that sites for users to sell BitCrystals also exist, but they are not the most user-friendly. While EDS has always been primarily focused on the blockchain gaming space, and exhibits at gaming conventions, they have also made a significant contribution to NFT origins and further developments in the space, even recently. EDS released a dual crypto wallet app called Casa Tookan late last year. There a collector can view their Bitcoin/Counterparty NFTs as well as Ethereum NFTs. Additionally, EDS' Casa Tookan is a brilliant marketing vehicle that also helps equip collectors to receive free BitCrystals, which in turn makes them more likely to buy NFTs. To explain, they run simple contests wherein the rules of which can only be accessed through the Casa Tookan app. Prizes include free NFTs as well as free BitCrystals. For example, a recent contest was to retweet a particular post of theirs with a certain hashtag, and that person would receive airdropped BitCrystals. On top of it being great publicity, it also increases user adoption of EDS' NFT wallet. I believe that any exploratory meeting between EDS and newer crypto art projects would be mutually beneficial, regardless of particular blockchain affiliation. In fact, although EDS and the art and gaming aspects of a project like pixEOS represent different blockchains, I would particularly urge some sort of partnership or collaboration between these two innovative projects. That is because they are both focused on games as well as NFTs, and each could--at the very least--learn from the other. Their user base and audiences appear to be complimentary, rather than competitive. While EDS recently revealed that due to the bear market, they have had to scale back some of their development, the also expressed public interest in partnering with more blockchain gaming projects. So there could be opportunities just waiting to be uncovered. As an NFT market, SuperRare has a great public presence at crypto art events and on social media. They are well respected in the space, and have a fine working product. Running on Ethereum, they are the go-to NFT market for when an artist only wants to release NFTs as an edition of just one (making it super-rare). As one of the early Ethereum NFT markets, and being based in New York City, which is a crypto art hub, they have attracted a crop of prolific and forward-thinking artists who are well-connected to promote their own art while simultaneously promoting SuperRare. I am one of these artists and have sold a decent number of pieces through their platform. SuperRare is a social collecting platform surfacing the world’s most unique and valuable digital art. Do you have artwork that you think is SuperRare? Submit it here! We’re currently in beta, and our community of curators is working to source artwork that best suits our current phase of > bootstrapping a new social art platform. We do our best to reply in a timely manner, but we appreciate your patience as > we get a lot of submissions! Link to artworks – Please submit at least 3 specific works using a Dropbox or Google Drive folder. What is the story behind these pieces? Why do you think they should be on SuperRare? How did you hear about SuperRare? I am pretty sure I filled out this form, but did not receive any contact from them for months. To be fair, they are a small business and at the time the team was still in the process of launching their marketplace--I don't even think it was live yet. 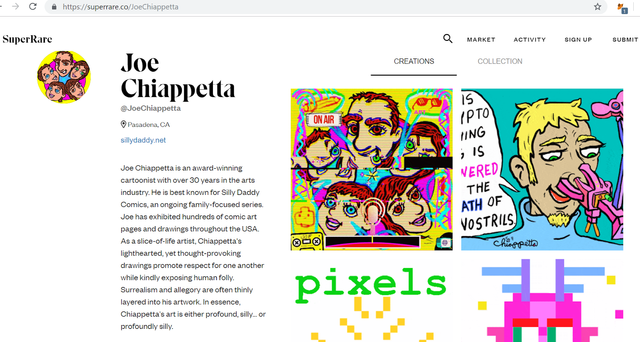 Then, since NYC is a remarkable crypto art hub, I went to an event there in May 2018, heard the SuperRare CEO speak on a panel, met him briefly and followed up with an email, which had links to some of my crypto art on CrystalsCraft. Shortly thereafter, SuperRare contacted me back and whitelisted my ETH address. This meant that I could submit art at-will to their market without further human approval. As long as I paid the low gas fees, that art would be live on their site as soon as the transaction cleared the ETH network. As an artist/entrepreneur, I thoroughly enjoy and highly value the process of being able to directly and quickly put rare digital art on the market without having to go through approval for each art item issued. I joined SuperRare's Telegram community, which currently has almost 200 members. It is active, professional, typically supportive, focused, yet also fun. Artists can learn a ton just by following their Twitter account and see who is doing what, as well as how they communicate what they are doing. Some of these artists are fantastic marketers themselves. And following them is "schooling" for anyone trying to figure out how to promote their work. Being part of the SuperRare stable of artists has a prestigious gallery feel to it. I say that because not all NFT markets have that feel to them. In fact, some feel more like being lost in an ocean flooded with too much content. Yet SuperRare certainly delivers a personal and professional tech gallery experience. These are not fly-by-night creators scouring the Internet for quick money-making schemes. These are die-hard artists who eat tech for breakfast and know the value of community. It is a real treat to be numbered among them. A user needs to have a browser-interactive Ethereum wallet with at least a few dollars worth of ETH to cover the transaction (gas) fees when issuing art. Often the gas price is only around $0.20 USD, but it varies. Learning how to install and use MetaMask as the desktop ETH wallet was the only option when I started on SuperRare. Now there are probably other options, including mobile wallets. SuperRare uses something called the Interplanetary File System (IPFS) to host the art files, and the Ethereum blockchain to host all the rest of the art data. Some believe that IPFS is better than hosting the images the traditional way that files are hosted on the Internet, where the image resides on one centralized server. With NFTs, a growing number of artists and collectors are concerned about future-proofing these files. In other words, if that server where an NFT image file is hosted goes down, or if the company paying for server space to host the image stops paying, what happens to the image? In the traditional manner of image hosting, that image would disappear from the collector's NFT wallet. The metadata would be there, but not the image. Some claim that IPFS addresses this issue. Yet Joe Looney, a respected and talented developer on Counterparty NFT projects, pointed out in a recent video that IPFS is not actually decentralized file storage and therefore not significantly better. When issuing NFTs, the artist must choose whether to price the NFT right away, or leave it unpriced. If unpriced, the NFT can be bid on by collectors. When a bid comes in, the artist gets an email alert. The artist can accept the bid, ignore the bid, or even set a specific sale price. Not all markets have this email alert feature when bids come in. Yet I consider it essential to successfully operating in this space, and am very glad SuperRare has such a feature. NFTs are typically priced higher on SuperRare. The higher price is justified by the extreme scarcity of the NFT. It is understood that this one edition is the only digital copy of that particular piece of art that will ever exist for sale to be owned on any blockchain. A decent number of my NFTs on SuperRare have been bought by collectors whom I do not know, while at least 1 or 2 pieces had been bought by a fellow artist/collector who also owns at least one edition of all my CrystalsCraft NFTs. Some of my SuperRare NFTs sell exactly for the price I set for it in the beginning. Yet some NFTs I have issued started with no price, and then bids came in on that NFT and I eventually approved a bid that I preferred. I have noticed also that somewhat animated GIF files appear to be more noticable and more likely to be sold. That's not to say that still images do not sell, but all other things being equal, since this is a digital space, artworks with even minimal animation have at least a slight competitive advantage. To give the NFT buying process more inroads from the physical world, SuperRare is known for setting up NFT exhibits at a number of crypto art events. These exhibits display the NFTs on iPads, framed and hung on a wall. Next to the iPad is a paper label with the title of the work, artist, and a QR code that directs a smartphone to that piece of SuperRare art where it can be purchased. These exhibits do require a keen eye for security, since a reliable staff person needs make sure the iPads do not get stolen. Learn from what SuperRare excels at. Their minimalist web design, bidding process, savvy social media presence, clear communication style, one-of-a kind nature, and ability to pull of public exhibitions make them stand out as a first-class NFT market. While SuperRare's stance on issuing only 1 edition of a particular piece through their platform does work very well for their brand, I do find myself all-too-often not issuing certain artworks through their platform. That is for those works in which I still want some level of rarity assigned to it, yet I also want more than 1 person to be able to own it. Coming from a lifelong comic book collector's perspective (as well as a comic book publisher), I do enjoy the idea of having a limited number of people who are able to bond over the fact that they collect the same limited edition comics. Therefore, other NFT markets are often more attractive to me when I want to issue an edition of 10, or 200. Therefore I would encourage other markets to give artists the choice of how many editions should be issued for each NFT design. Serious players in the crypto art space should also consider spending some time navigating the New York City crypto art scene. Many crypto art projects have the headquarters there, and the fact that these projects all seem to know each other and often promote each other's success gives the NYC crypto art projects an extra layer of prestige as well as networking leverage. Market makers are there, and operate as a loose coalition advancing this budding industry. In addition to SuperRare having their operations in NYC, the following crypto art projects are also located there: Rare Art Labs, Dada.nyc, CreativeCrypto, Portion.io, New Art Academy, and many more. It should also be noted that the SuperRare team recently launched a completely separate NFT product called Pixura. In Pixura, any creator can launch their own NFT marketplace on Ethereum in minutes, with no coding required. For artist wanting their own completely separate sales and showcase environment for NFTs, this is an attractive option. A takeaway lesson from this has to do with the availability of smart, business-friendly options. Basically, the more choice an NFT project gives the artists and collectors, the wider the net they can cast to draw in a larger and more diverse customer base. 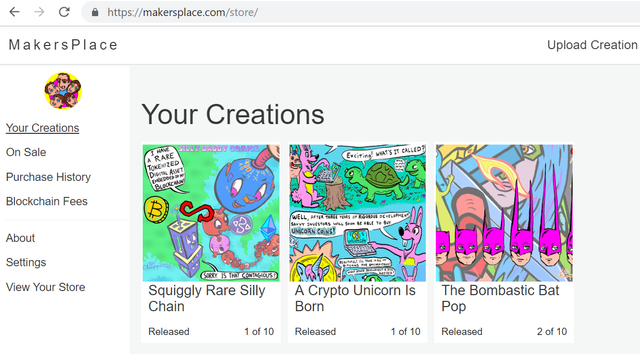 MakersPlace is an Ethereum NFT market headquartered in San Francisco. They have quickly risen to prominence in the crypto art scene. Excellence comes to mind when I think of the MakersPlace NFT experience. Their site is highly user friendly, for both artists and collectors. They host many fine illustrators and have a very hard-working team. Someone at OpenSea, a big NFT market, connected me to MakersPlace through an email introduction. Without any apparent vetting (perhaps they looked my name up in advance), MakersPlace quickly contacted me, gave me an invite code, and in the same email asked me to tell them a little about myself. Once I started issuing NFTs through MakersPlace (which is very easy) I engaged in a number of emails with the team. This was out of professional comradery and to get me fully oriented on their platform. They are very helpful and quick to respond. Additionally they are humble people, eager and willing to learn from their artists where they can. MakersPlace organizes numerous meetups to educate artists and collectors about their platform, building great loyalty and community along the way. As stated previously, for artists new to the crypto space, navigating these waters can be a bit tricky. So having a marketplace like MakerSpace to take much of the friction out of the NFT business process can be a great blessing. MakersPlace is active and supportive of their artists on social media. They also have a Discord channel with over 500 members of their community. I have found it to be professional and helpful. That said, I prefer the simplicity of Telegram for communities. While this is merely my own personal preference, because of that inclination, I am currently less active with the MakersPlace community because I don't open up the Discord app as much. To issue (and also to buy) NFTS, the user needs to log into their site by creating a user name and password. The common browser add-on MetaMask is not needed for this market, which makes MakersPlace extra-new-user-friendly. They provide each user with an Ethereum address and their own wallet. They also cover the ETH gas fees for issuing NFTs. To issue NFTs, the artist fills out a metadata form, uploads the art file (which currently must be no more than 35MB), and provides appropriate tags to increase search discoverability. In usually a few minutes (or less), the NFT is live. Then a price can be set, or it can be left unpriced in expectation of bidding action. The fact that MakersPlace allows the artist to set the rarity of each NFT is highly attractive to me. These choices make it my go-to market when I want to issue NFTs on Ethereum in editions higher than one. In harmony with their position to remove the friction from the entire NFT process, not only does MakersPlace cover the gas fees when collectors buy NFTs, but they offer multiple purchasing options. A collector can send ETH to their MakersPlace wallet and buy the art with ETH, or buy it with a credit card. To win new professionals and serious collectors over to the ever-increasing benefits of crypto art, quality education must become a huge component. It is recommended that projects imitate MakersPlace's example of hands-on educational meetups where possible. Various how-to videos and NFT educational articles have also proven useful. Give creators and collectors as much choice as possible. Following MakersPlace's lead, do this while also keeping the user experience as non-technical and simple as possible. Their de-emphasis of crypto culture in favor of popular themes in the mainstream world of illustration and art also make them well-positioned for more mainstream adoption. Other crypto projects could learn from their wise example in how to reach audiences beyond the relatively small niche of all things crypto. As a rare digital artist, currently on 8 different NFT platforms, it is easy to observe that there is a ton of development going on in the crypto art space. One has a hard time keeping up with it all. In fact, there are many other reputable NFT markets out there that I know very little about, with more on the way. This brings up a cautionary note. Working previously at a major metropolitan chamber of commerce for many years, I know that when supply increases way faster than demand, times will get tough for the suppliers--to say the least. In light of this, I believe that while innovation is happening at breakneck speed in crypto art, not all is rose colored. A real issue that the industry may soon face is that the crypto art market will be flooded with art suppliers faster than collectors can be educated and won over to purchase NFTs. I saw this happen in the eBook market and I believe the crypto art market could be next. Therefore, projects and professionals would do well to constantly innovate, market wisely, form strategic partnerships, and gamify the process of collecting art as much as possible. Spells of Genesis, along with pixEOS, stand out as projects that not only have these elements on their radar, but also have delivered great products using these principles as well. Future projects that create ways for a collector's personal NFT collection to be used as digital game pieces will likely become the next area for opportunity. Blockchain games that allow these digital goods to become playable components of an art-friendly environment will gain a competitive advantage. Indeed, they will be more prone to ascend as the stand-out winners while other NFT markets become potentially oversaturated. To guard against such oversaturation, I would also want the best of all projects mentioned in this article to be combined into 1 master blockchain ecosystem. Thinking as a collector who used to hold over 10,000 comic books, I did not keep my collection in separate rooms based on which store I bought the comics at. Rather I grouped them together in one master collection. The same should become possible for NFT collections. Instead of having to show people 8 different NFT wallets for them to see my collection, I prefer to go to only one place to see the whole collection. While this is not possible yet due to the current autonomy of the various blockchains, I do believe the projects who figure out how to securely deliver on this functionality will have first-mover advantage. Similarly, the mainstream art collecting and gaming world has little allegiance to Bitcoin, Counterparty, Ethereum, or even EOS, which is on the cusp of also launching NFT markets. Crypto art projects must keep that lack of allegiance in mind since significant growth must come from the mainstream as crypto-adoption becomes more user friendly. Therefore what is needed is mostly what already works: good rare art, easy to use marketplaces, gamification, respectful communities for collectors, artists, and gamers, as well as entertaining education about this new crypto collectible landscape. Combine all that with stable cryptocurrency powering an NFT market underneath the hood, and winning projects will result. Studying the recommendations I have made at the end of each section, I hope you will find many ideal parameters that could take the crypto art world to mainstream adoption, and beyond. Thanks Scrilla! And I don't recall seeing you on Steemit before, so really glad you made it. I will confess, I don't "totally" grasp the concept as of yet. But I will most certainly re-read your post, and try to get a better understanding of it. I am reminded of the virtual world Second Life where items can be created, then sold... I remember explaining this concept to people; their reactions were something like, "you are spending money on 'pretend' land?" Please understand I'm not trying to compare your art in any way, to this information... rather, trying to understand better the concept of this digital art. As you can see, my mind (or gears rather) is turning... thank you again for sharing this... I must go to study more! Thanks for sharing your reaction. The quickest way to "get" this whole concept is to actually receive some rare digital art for free. Then it makes more sense. So on the BitCrystals Telegram (and other places) they give away rare digital art from time to time. Feel free to join that group.